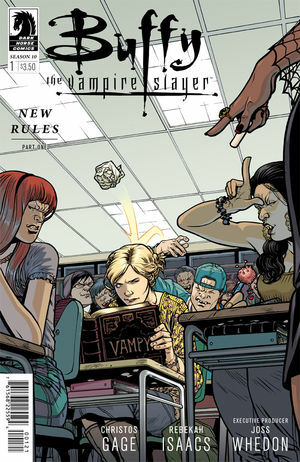 If you’ve been wanting to try the Buffy the Vampire Slayer comic, issue #1 of season 10 is a terrific place to start. Christos Gage captures the character’s voices authentically, and he manages to cram in lots of exposition (to remind readers of the new status quo) while still keeping the storytelling interesting. Of most interest to fans is that just about EVERYone shows up here. Buffy’s fighting vampires with Spike, Willow has her magic back, and Xander, Andrew, and Dawn are support staff. There are a bunch of surprise guests I don’t want to spoil, but you’ll be thrilled to see them. Gage puts forward clever gimmicks while demonstrating a strong sense of the series’ history, both previous comics and TV episodes. Rebekah Isaacs does a fabulous job drawing the characters and events while still making room for all the narration and dialogue. Adventurous as this cast is, they also love to wisecrack a lot. Isaacs has a great sense of motion; the characters look like they’ve been captured in the middle of the action. The challenges are particularly interesting. The stupider-than-usual zompires of the previous comics are gone, and in their place are vampires with new abilities. Events are complicated by Vicki, a vampire slayer who’s also a vampire. I can’t wait to see more!